What, you say you don’t understand the ongoing obsession with MIDI control of games and game control of MIDI? Fine: here’s your killer app, likely to silence all critics. It’s MIDI-controlled Pong for Mac OS X. Now, truly: who wouldn’t want that? The real question is, can we get two MIDI guitars together and manage to pull off “dueling banjos” AND get a decent Pong score? 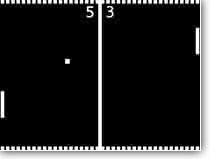 I know what you’re saying: can the small data bandwidth of MIDI really pull off the level of nuance required to play a sophisticated game like pong? I think we’ll have to settle. This one will be a must for the CDM Party in the works. If you still think it’s a bad idea, let me buy you a few drinks. (Stay tuned.) Another Atariboy link; thanks, Cris! On the same site and more useful: a Nord rack emulation for Reaktor.